There's too much going on right now. I just got home from a great trip to Montreal. The very next day we had to take the girl to register her for Kindergarten in the fall. 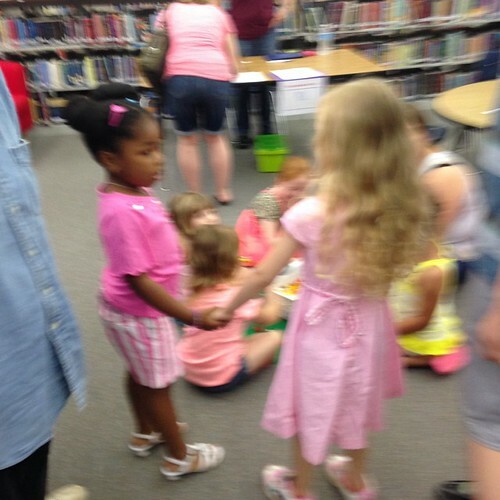 She immediately met another little girl there, whose name was Judy. They have decided to be friends as you can see. Best friends, if memory serves. It was really wonderful to be back at the school, so many teachers and even the Principal came up and said "I remember when you had her", it was such a feeling of community. It's nice to be in a place where people know you and have memories of you. I really felt good knowing people there are excited to see her so grown up and ready for school. She's ecstatic. She's been telling everyone since her birthday that she gets to go to school now because she's five. I would've been sad and probably weepy except that she was SO excited it was impossible to feel anything but happy. Now that we've squared that away I'm gotten properly sick. I'm not sure why or how, but I am. I have a death cough, fever and a sore throat. I'm pretty sure this is something both terrible and contagious. What makes it super charming and awesome is that in three hours I'm heading out to go on another work trip for four days. But not before I infect everyone travelling with me and everyone at the conference I'm going to. My doctor gave me boosters of all of my vaccines because I'm travelling internationally on a regular basis. Apparently sinus infection doesn't have a vaccine. Pity.